very year on the first Monday in October we use World Habitat Day to reflect on the state of the world’s growing cities and our planet’s rapid and irreversible urbanisation. We worry not only whether we can manage this growth, but how we can do it positively in a way that makes cities inclusive, welcoming places for all. As populations increase and more and more people migrate, cities lure us to their bright lights. Like moths to a flame, we also worry also about getting burnt. How many more people will end up in the developing world’s growing slums? Will there be jobs, shelter, water, electricity, health services, for all? Will we be able to cater for their basic needs even if we cannot do the impossible and meet the aspirations of all? Rapid and irreversible. Those are the trends today of the greatest rates of migration and urbanisation the world has known. According to the latest UN research, international migrants numbered 191 million in 2005: 115 million lived in developed countries, and 75 million in developing countries. Half of these people on the move, it is noted, are women. As we reflect on the theme of World Habitat Day 2006, Cities, magnets of hope, I wish to draw your attention to some new facts about the urban world in which we live. These have just been published in our latest State of the World’s Cities 2006/7 report: Some time during the course of next year, demographers watching urban trends will mark it as the moment when the world entered a new urban millennium with the majority of people living in towns and cities for the first time in history. The year 2007 will also see the number of slum dwellers in the world reach the 1 billion mark – when on average one in every three city residents will be living in inadequate housing with no, or few basic services. It is still unclear how this will influence government policies and actions, particularly in relation to Millennium Development Goal 7, Targets 10 on water and sanitation, and 11 aimed at improving the lives of slum dwellers. They are better able to withstand the volatility of the global economy than those with less urbanised populations. Urban-based economic activities account for up to 55 percent of gross national product (GNP) in low-income countries, 73 percent in middleincome countries and 85 per cent in high income countries. And major contributors here are the migrants who helped build many of the world’s greatest cities, the people who had the courage to pack up and move. We need to look at ways of making our cities inclusive places able to provide for all. Instead of building fortresses, we need to build more bridges. But it is important to understand that the growth of cities is not just a phenomenon of migration from rural to urban areas. It also entails international migration – people seeking a better life in other countries both in the north and in the south. Whether they are fleeing conflict, disasters or simply seeking a better life somewhere else, the number of people on the move today is greater than ever before. It is very difficult to stop the flow of people into cities and towns. Urbanisation is one of the most powerful, irreversible forces in the world. It is estimated that 93 percent of the future urban population growth will occur in the cities of Asia and Africa, and to a lesser extent, Latin America and the Caribbean. Migration too is one of the great irreversible forces, and one likely to grow. Frequently discussions on how to manage it are steeped in controversy and rancour. This is in part because policy making and coordination at the international, national and municipal level is lacking. Some countries complain about the brain drain, but there is also the fact that the remittances immigrants send home could be far larger in financial terms than gross overseas development aid or foreign direct investment. Thus, it is a question of striking a balance. Cities make countries rich. Countries that are highly urbanised have higher incomes, more stable economies, stronger institutions. Opinions expressed in signed articles are those of the authors and do not necessarily reflect the official views and policies of the United Nations Human Settlements Programme (UN‑HABITAT). All material in this publication may be freely quoted or reprinted, provided the authors and Habitat Debate are credited. Cities: Magnets of Hope In a world where greater numbers of people are packing up and moving than ever before, the big draw, is the lure of towns and cities. Here the editor, Roman Rollnick looks at some of the problems facing today’s migrants - those who are defined as people born outside their country of residence. Rescued would-be immigrants risk all for a job in Europe. Photo ©: by Darrin Zammit Lupi, Staff Photographer, Allied Newspapers Limited C, courtesy of timesofmalta.com. This photo was kindly loaned to UN-HABITAT for one-off usage in this magazine. International migrants numbered 191 million in 2005: 115 million lived in developed countries, and 75 million in developing countries. Between 1990 and 2005, high-income countries registered the highest increase in the number of international migrants (41 million). Three-quarters of all migrants lived in just 28 countries in 2005, with one in every five migrants in the world living in the United States. Migrants constitute at least 20 percent of the population in 41 countries, 31 of which have less than a million inhabitants. Female migrants constitute nearly half of all migrants worldwide, and they are more numerous than male migrants in developed countries. Nearly 6 out of every 10 international migrants live in high-income economies. These include 22 developing countries, including Bahrain, Brunei Darussalam, Kuwait, Qatar, the Republic of Korea, Saudi Arabia, Singapore and the United Arab Emirates. About a third of the 191 million migrants in the world have moved from one developing country to another, and another third have moved from a developing country to a developed country. Migrants with tertiary education constituted just under half of the increase in the number of international migrants aged 25 or over in OECD countries during the 1990s. Nearly 6 out of every 10 highly educated migrants living in OECD countries in 2000 came from developing countries. – International migration and development Report of the UN Secretary-General, 2006. World Bank, and Mr. Enrique Peñalosa, the former Mayor of Bogotá, Colombia, now a Visiting Scholar at New York University, explained what this meant at a plenary session: “These 2 billion new urban inhabitants will require the equivalent of planning, financing, and servicing facilities for a new city of 1 million people, every week for the next 30 years,” Ms. Sierra said. “Imagine,” added Mr. Peñalosa, “that means a new city each week the size of Vancouver.” Just as the World Urban Forum marked a turning point in the international debate on sustainable urbanisation, Mr. Peter Sutherland, the SecretaryGeneral’s Special Representative on Migration, said he hoped the United Nations General Assembly’s High-Level Dialogue on International Migration and Development in September 2006 would lead to the establishment of a new Forum on migration. Ms. Thoraya Ahmed Obaid, UnderSecretary General of the United Nations and Executive Director of the United Nations Population Fund (UNFPA), agrees. Her view is that the world must put migration at the centre of the global development agenda and integrate it with population policy. Proper policies would help alleviate crises when they arise. At the time of publication, the International Organization for Migration (IOM) reported that it was trying to help about 200,000 Bangladeshi, Ethiopian, Filipino, Nepali and Sri Lankan migrant workers stranded in conflict-torn Lebanon. And off the coast, in the Mediterranean, the plight of a Spanish trawler crammed with African migrants it had rescued also made headlines as it waited days at sea for some country to allow it in. It is no surprise, when one looks at the rough edge of urbanisation that it coincides with the extremes of emigration: that in sub-Saharan Africa, the region with the world’s highest annual urban growth rate (4.58 percent), and the world’s highest annual slum growth rate (4.53 percent), people don’t necessarily like to stay at home. They know their prospects of a good job and a decent future are pretty slim in a continent where 72 percent of urban dwellers live in slums. This is why increasing numbers of people risk all, and use their life savings to pay criminal syndicates to ferry them to Europe, or, in the case of poorer Latin American countries, to the United States. People smuggling is big business. Immigrants are able to contribute not only to their new countries, as they have always done, but their vast flows of remittances home — which last year exceeded US $230 billion — now dwarf international aid. On the negative side, cities are also home to broken dreams: migrants with university degrees driving taxis or washing dishes; or illegal workers hiding in abysmal conditions, with nowhere to turn in the face of exploitation or illness; those who end up in slums; the secondgeneration migrant born and raised in the city still derided as a foreigner by the neighbours. Floating in a sea of uncertainty: more and more migrants desperate to reach Western Europe No-one tells the young people in Senegal, Mali, or Pakistan that not all of those who unwittingly pay unscrupulous crime syndicates their life savings for a perilous journey on a rickety boat to Europe and a job will make it. For years each summer, their bodies wash up on beaches along the shores of the Mediterranean from southern Spain, to Malta, Italy and beyond. Here Tom Osanjo of UN-HABITAT’s information service looks at a growing crisis the European Union has spent years trying to resolve. or many young people especially from the poor nations of West Africa, the only way to improve their lot is to pay money to the brokers who then facilitate some of the riskiest treks human beings can embark on – across the howling sands of the Sahara Desert and then into dinghies, often barely able to float, for a dangerous passage across the Mediterranean to a ‘promised land’ yonder. No matter that they face arrest, deportation or death at any time during the journey. Throughout the ages, the human desire to improve one’s lot has prompted people to seek greener pastures in far away lands. With the world demarcated between poor and the rich, the latter will always attract people. According to the International Organization for Migration (IOM), migration is considered one of the defining global trends of the early 21st century with more and more people on the move today than at any other time in history. There are now about 192 million people living outside their place of birth, which is about 3 percent of the world’s population. It was thus that for a week in June this year, a Spanish trawler packed with would-be African migrants it had rescued from drowning plied the southern Mediterranean in search of a port of call. The story of their plight made headlines around the world, but no country, European or North African, would allow the ship and its unwanted African passengers to drop anchor on its shores. The trawler, stranded off the coast of Malta, became a symbol of the European Union’s immigration dilemma as countries haggled for days over who should take them in. “The diplomatic impasse between Spain and Malta over the fate of 51 migrants, to whom Malta refused entry (except those taken in for medical care) since they were saved in Libyan waters by a Spanish trawler, the Francisco y Catalina, which instead decided to head to Malta, truly tested the limits of European countries’ humanitarianism,” said the Times of Malta in an editorial. knows how many people die each week in a stretch of ocean where Europeans and Africans have traded for centuries. So easily do tempers flare in the migration debate, that the Italian police arrested the crew of a fishing vessel which rescued a group of migrants dying of thirst as their boat drifted in mid-ocean, its motor broken. Spain, meanwhile, is dealing with a similar crisis in the Canary Islands, with some 11,000 African migrants arriving on the island chain so far this year. Many governments are calling for increased policing of international waters and tighter migration laws. As Europe gets ready to guard its southern flank, tough talk and shows of force appear to have drowned out the humanitarian issues floating right in the middle of the Mediterranean Sea. In times of conflict, the vulnerability of migrants from poorer nations is especially acute. As the hostilities in Lebanon escalated, the richer countries sent warships and planes to evacuate their citizens. This was not the case, however, for the thousands of migrant workers from Bangladesh, The Philippines and Sri Lanka left to try and fend for themselves. The trawler saga is not the first time a shipload of migrants or refugees had been turned away. It is unlikely to be the last. The Spanish trawler, crammed with Eritrean migrants rescued on the high seas, that was turned away by several countries. Photo ©: by Darrin Zammit Lupi, Staff Photographer, Allied Newspapers Limited C, courtesy of timesofmalta.com. This photo was kindly loaned to UN-HABITAT for one-off usage in this magazine. Civic values, culture and rural-urban migration UN-HABITAT’s Governing Council at its 20th session cited the term civic values in its resolution on civil society. Father Gerard Whelan SJ, former advisor of the Holy See in Nairobi for UN-HABITAT, who worked for six years in a poor urban parish in Nairobi, many of its residents migrants from the countryside, says the term must be clarified. He now teaches social and pastoral theology at the Gregorian University in Rome. any delegates at the 20th session of the Governing Council in 2005 discussed this issue. Many raised the concern of their governments about the decline of civic participation among their people. This extends from reduced participation in government elections to reduction of membership in sports teams. A phrase in the GC resolution on youth opened discussion on the question of what is happening with respect to “the inter-generational transmission of values.” In a variety of GC discussions, the importance of decentralisation of government and participatory approaches to governance was discussed and widely accepted. Yet the dilemma seems to be this: just as governments are increasingly appreciating the value of an active civil society, the actual desire of populations to engage in it seems to be diminishing. Of course, academics such as Robert Putnam have made valuable contributions here. However, I like to draw on a philosophical system of a hierarchy of values that each person holds naturally – one of vital social, cultural, personal and religious values (Bernard Lonergan, Method in Theology, University of Toronto Press, Chapter 33). Civic participation in social institutions is declining in many countries. Commitment to social institutions is motivated by values such as honesty, a concern for others, patriotism etc. sharing with the Bible. From the parish centre we teach leaders of these groups non-domineering styles of leadership. This helps drive truly participatory meetings. In this faith-sharing, women have an equal voice with men, tenants with landlords and, last but not least, members of different ethnic groups reveal to each other that they have similar spiritual experiences. Members of our small Christian communities have agreed on a priority list of social problems in the area that need addressing. These are: crime, alcoholism and HIV/AIDS. In undertaking action, we reach out to other Christian denominations in the area and also to Muslims. As Faith Based Organisations, taken together, we are now a force in local politics that is reconciling and progressive. A Jesuit colleague points out that radical changes in social behaviour are occurring in African cities. However, these seem to occur without a self-conscious choice or any wise direction. A result can be what has to be called a fragmentation and break down of cultural values in the city. At the same time, backward looking nostalgia for the (rural) culture of the past is inappropriate — and it is striking how women are often more clear on this point than men. (Aqualine Tarimo SJ, Social Ethics and African Renaissance, Acton Press, Nairobi, 2006). In many highly industrialised countries, most cities have received successive waves of immigrants: the Lower East Side of New York, the Kensington Market area of Toronto, and numerous suburbs in greater Los Angeles. Several cities (New York, London, Vancouver, San Francisco) have well established Chinatowns. There are newer ones too, like the Cubans in Miami’s little Havana, the Russians in Little Odessa (Brooklyn, NY), the Dominicans in Washington Heights (NY). Berlin’s Kreuzberg area, known as Little Istanbul, is home to 200,000 Turkish immigrants. The Goutte d’Or neighbourhood of Paris is home to tens of thousands of immigrants from north and west Africa. It is a pattern of enclaves that is also observed in developing countries: significant international communities are present in Abidjan, Cote d’Ivoire (mostly from neighbouring countries); Johannesburg (from Zimbabwe, elsewhere in the region, and Nigeria); Bangkok, Thailand (from Burma, Cambodia and China); San Jose, Costa Rica (from Nicaragua), and some Arabian Gulf capitals (from southeast Asia). Source: UN-HABITAT State of the World’s Cities 2004/5. Women on the move According to the United Nations 2006 International migration and development Report, female migrants constitute nearly half of all migrants worldwide. And they are more numerous than male migrants in developed countries. Yet, in many societies it is assumed that women migrate for reasons of marriage or family reunion. That view, however, is misleading, says Monica Boyd, Professor of Sociology at the University of Toronto in this excerpt of a study for the UN Division for the Advancement of Women. The more immigrants, the less xenophobia Like most wealthy countries, Norway is debating immigration. According to the Oslo-based researcher and social commentator, Professor Thomas Hylland Eriksen, Senior Research Fellow at the University of Oslo, suspicion and misguided selfishness are highly visible traits in this debate. Many of these illegal immigrants eventually become legal, and the social mobility is very significant both in the first and second generations. Xenophobia tends to be most widespread in the areas with fewest immigrants. It is not a big problem in London, a city which has been transformed rather dramatically, demographically speaking, in the last few decades. Add to this the economic importance of remittances from immigrants, which last year exceeded US $230 billion surpassing the total amount of foreign aid, with no expensive experts or bureaucracies. between donors and recipients. Entire communities in the developing world depend on remittances. (see table page 17). It is estimated that each dollar sent home by Filipinos working in the USA leads to three dollars of value added. The money sets wheels in motion. There are, plainly, no good arguments against allowing increased labour migration into European countries. Their labour is needed in our countries with their ageing populations; they enhance and widen the scope of national identities; their remittances help out at home; and their children have opportunities only dreamt about a generation earlier. The problem for a country like Norway is, therefore, not how to limit the number of asylum-seekers or labour migrants, nor how to mitigate the conflict between immigrants and the domestic working class. The problem is about attracting professionals. In the foreseeable future, there will always be a certain supply (and a certain need) for unskilled labour, but there are several reasons why this kind of country needs a varied influx of immigrants, in terms of age, gender and professional qualifications. Virtually every immigrant I know in this country who was highly qualified professionally upon arrival, came here because they had fallen in love with a Norwegian. Few others seem to be attracted by the country. In Bangalore, they have heard that Norway is a backwater with a hellish climate – a xenophobic place where they speak an obscure language. Had Norway wished, and been able to attract, say, 1.5 million entrepreneurial immigrants of varied backgrounds to the area around the Oslo Fjord (the most urbanised part of the country), the country would have looked very different in a generation or so. It is unlikely to happen. But people ought to know what they’re missing. Urban Policy Implications of International Migration In the last decade, globalisation has come to the fore as a major driving force in the shaping of urban development posing new challenges to urban management, write Marcello Balbo, professor of Urban Planning at the Faculty or Urban and Regional Planning, Universita Iuav di Venezia and Rafael Tuts, Chief of UN-HABITATâ&#x20AC;&#x2122;s Training and Capacity Building Branch. This article is excerpted from a more detailed study published jointly by UN-HABITAT and the Universita Iuav di Venezia, entitled, International Migrants and the City. Source: United Nations, Trends in Total Migrant Stock: The 2005 Revision. Note: The boundaries shown on this map do not imply official endorsement or acceptance by the United Nations. International Migrants and the City – Johannesburg Jonathan Crush, Director, Southern African Research Centre, Queen’s University, Canada and Honorary Professor, Department of Environmental and Geographical Science at the University of Cape Town, looks at migration in Johannesburg, South Africa’s largest and fastest growing city. African citizens and officials, as well as personal and family safety problems. South Africa’s national immigration policy is so restrictive that it actually fosters unauthorised foreign migration. Whatever the truth of that claim, one result is that Johannesburg is host to a wide variety of scams and a considerable trade in forged documents, as immigrants pay to legitimise their stay. The failure to highlight immigration as a major policy issue goes deeper than the problem of competing priorities. A good example of this is that the city also tends to disregard the fact that almost a third of the population consists of internal migrants, with their own particular needs and priorities. The problem, then, is fundamentally about the failure of Johannesburg’s city managers and planners to recognise the centrality of migration, the challenge to mainstream migration into all facets of city governance and a tendency to view it as a problem rather than a potential set of opportunities. Current strategic development plans are notable for their lack of attention to migration. In a predominantly xenophobic climate, it has been difficult for the City to think outside the box and to recognise that international migration does not need to be seen as a threat and can offer significant opportunities. To achieve this reorientation in Johannesburg requires at least three things: n	Stronger recognition in city governance structures that Johannesburg is a city of migrants. Migration needs to be mainstreamed in all planning and strategy-making. n	There is a surprising lack of solid, reliable and current information on international migrants in Johannesburg. Systematic and comprehensive primary research on international migration is a pre-requisite for sound policy development. That research still needs to be urgently undertaken. n	Greater dialogue between city managers, migrant experts and migrants themselves is needed. Johannesburg is a globalizing city in need of a constructive conversation about the challenges of managing international migration to the benefit of all. International Migrants and the City – Vancouver Vancouver now has one of the highest proportions of foreign-born residents – 38 percent in 2001 – among cities in countries with advanced economies, writes Michael Leaf of the University of British Columbia. mmigration into Canada, and Vancouver especially, underwent a profound shift in the final decades of the 20th century from a predominantly European origin to one that is increasingly Asian. framework of working relationships across three tiers of government – national, provincial, and municipal. Perhaps more importantly, the infrastructure of immigrant integration is not purely a government concern, as it rests upon a wide base of voluntary and community-based organisations; this base allows for direct interaction between new immigrants and existing residents at neighbourhood levels. The main lessons to be drawn from Vancouver stress the need for close collaboration between local State agencies and community-based groups, especially those rooted within immigrant communities. In addition, it is crucial that immigration affairs do not remain marginal to the concerns of urban society overall. Specific areas for policy attention include media policy, language policy, and policies to address the spatial distribution and accessibility of services in support of immigrant integration, with each of these areas of concern to be addressed both in terms of the immediate needs of new immigrants and with regard to their eventual full involvement in urban society. The ultimate goal of such strategies should be to move beyond simple multiculturalism and its emphasis on respecting cultural difference, and work to encourage a form of cosmopolitanism that is supportive of close interaction between residents from differing cultural backgrounds. In quest of humane solutions as irregular migration grows and grows At the Rabat conference on migration in July, Morocco urged the European Union and African Union Tripoli Ministerial Conference to convene as soon as possible this year to follow up the Rabat recommendations. Michael Frendo, Minister of Foreign Affairs of Malta, who attended the gathering of 50 nations, says more has to be done to enforce international agreements, boost development assistance and to fight the international crime gangs running lucrative migration and human trafficking rackets. ganizations send illegal immigrants along various routes. One of the main arteries here links Libya with Malta and Italy. Statistics using data from the past 18 months show that Malta has illegal immigrants from Benin, Burkina Faso, Congo, Gambia, Ghana, Guinea Bissau, Ivory Coast, Liberia, Mali, Morocco, Niger, Nigeria, Senegal Sierra Leone and Togo. So the international community cannot compartmentalize this issue. Migratory routes are interlinked; international criminal organizations make sure of that. For them transporting migrants is big business. What is the solution? We can only have a comprehensive plan. We must not close one road for the traffickers and leave “softer” options open. Along with joint patrolling of the western Mediterranean, we must have joint patrolling of the central Mediterranean area. The message to criminal organizations must be that no route will be easy anymore. All countries must fight international criminal organizations. And international law should be respected. Article 13 of the Cotonou Agreement signed by African countries calls for the repatriation of illegal migrants. This must be followed by all nations. Development assistance is clearly a very important part of the solution to ensure that people retain the hope of making a living for themselves and their families in their own societies. In all this, we must retain an unremitting commitment to provide full protection to refugees and persons requiring humanitarian status. We need urgent action. For the 400,000 citizens of my country crammed in 36 square kilometers, this is truly vital. Malta needs help – now. European and African ministers representing 50 countries agreed at a two-day meeting in Rabat, Morocco in July that the waves of illegal migrants seeking a better future in Europe would not be stopped unless Europe helped Africa fight poverty. The meeting marked the first gathering of ministers representing countries from which the migrants come, those through which they travel, and the countries of final destination. Spain said it would commit 10 million euros (US$13 million) to help would-be African migrants set up small businesses. Mauritania, a springboard for illegal migrants sailing to Spain, got a 2.45 million euro European Union grant to help it cope with migrants. France suggested a “savings development fund” giving tax breaks to migrants investing in their country. Several European countries said they were working on making it easier and cheaper for migrants to send funds back home. Morocco said the EU had promised it 70 million euros. With Africa’s population rising sharply, economic growth has not kept pace. In 2001, around 46 percent of sub-Saharan Africa’s people lived on less than $1 per day. French Interior Minister Nicolas Sarkozy said Africa and Europe had to work harder to give African youth confidence in there future. This was a priority. But he also warned that opening Europe’s borders to all could lead to a political destabilization of both Africa and Europe and would fuel racism. European ministers also pushed for African countries to take back illegal migrants. Migration can be made to benefit everyone Ever since national frontiers were invented, people have been crossing them – not just to visit foreign countries, but to live and work there. In doing so, writes United Nations Secretary-General Kofi Annan, people will always take risks to overcome adversity and live a better life. istorically, migration has improved ices and working with migrants to develthe well-being, not only of individop their home communities, governments ual migrants, but of humanity as a whole. are multiplying the benefits of migration. And that is still true. Migration, at least in In some countries, migrant associations are the best cases, benefits not only the migrants transforming their communities of origin themselves but also the countries that receive by sending collective remittances to support them, and even the countries they have left. small-scale development projects. How so? Successful migrants often become inIn receiving countries, incoming mivestors in their countries of origin, and engrants do essential jobs which a country’s courage others to follow. Through the skills established residents are reluctant to unthey acquire, they also help transfer technoldertake. They provide many of the personogy and knowledge. India’s software indusal services on which societies depend. They try has emerged in large part from intensive care for children, the sick and the elderly, Families with members working abroad networking among expatriates, returning bring in the harvest, prepare the food, or spend more on education and health care at migrants and Indian entrepreneurs both at clean homes and offices. home. If they are poor, like the family in the home and abroad. After working in Greece, They are not engaged only in menial activ- classic Senegalese film, Le Mandat, receiv- Albanians bring home new agricultural skills ities. Nearly half the increase in the number ing remittances may introduce them to fi- that allow them to increase production. And of migrants aged 25 or over in industrialized nancial services, such as banks, credit unions so on. countries in the 1990s was made up of high- and microfinance institutions. Yes, migration can have its downside, ly skilled people. Skilled or unskilled, many More and more governments understand though ironically some of the worst effects are entrepreneurs who start new businesses, that their citizens abroad can help develop- arise from efforts to control it: It is irregular while others are artists, performers and writ- ment, and are strengthening ties with them. or undocumented migrants who are most ers, who help to make their new hometowns By allowing dual citizenship, permitting vulnerable to smugglers, traffickers and othcentres of creativity and culture. Migrants overseas voting, expanding consular serv- er forms of exploitation. Yes, there are tenalso expand the demand for goods sions when established residents and and services, add to national promigrants are adjusting to each other, duction, and generally pay more to especially when their beliefs, customs "No longer do those who emigrate sepa‑ the state in taxes than they take out or level of education are very different. rate themselves as thoroughly as they once in welfare and other benefits. And in And yes, poor countries suffer when did from the families and communities regions like Europe, where populasome of their people whose skills are tions are growing very slowly or not most needed, for instance healthcare they leave behind. No longer do the vast at all, younger workers arriving from workers from southern Africa, are majority settle in just a small number of abroad help to shore up underfund“drained” away by higher salaries and developed countries: about a third of the ed pension systems. better conditions abroad. world’s nearly 200 million migrants have All in all, countries that welcome But countries are learning to manmoved from one developing country to migrants and succeed in integrating age those problems, and they can do another, while an equal proportion have them into their societies are among so better if they work together and gone from the developing to the devel‑ the most dynamic – economically, solearn from each other’s experience. oped world. In other words, those moving cially and culturally – in the world. That is the object of the “high-lev'South-to-South' are about as numerous as Meanwhile, countries of origin el dialogue” on migration and develthose moving 'South-to-North'. Migrants benefit from the remittances that miopment that the General Assembly is grants send home. Last year, these toholding. (September, 2006). are not just engaged in menial activities. taled around $232 billion last year, As long as there are nations, there Highly skilled persons constituted just un‑ of which $167 billion went to dewill be migrants. Much as some der half of the increase in the number of veloping countries – greater in volmight wish it otherwise, migration is international migrants aged 25 or over in ume than current levels of official aid a fact of life. So it is not a question countries of the Organization for Economic from all donor countries combined, of stopping migration, but of managCooperation and Development (OECD) though certainly not a substitute. ing it better, and with more cooperaduring the 1990s". Not only do the immediate recipition and understanding on all sides. ents benefit from these remittances, Far from being a zero-sum game, mibut also those who supply the goods gration can be made to yield beneand services on which the money is - UN 2006 International migration and development fits for all. spent. The effect is to raise national Report income and stimulate investment. wenty migrants living in a Paris hostel burnt alive or jumped to their deaths in April 2005 when a fire ripped through the dilapidated six-storey building in which they lived. Almost all of the victims were African migrant families waiting to be re-housed. The event garnered international attention as the media focused on the plight of migrant families, their poor housing conditions and the lack of proper safety procedures. President Jacques Chirac declared it one of the city’s “most painful catastrophes.” Despite the high profile attention, the situation was soon replicated a few months later when 14 children and three adults died in another apartment block used by charitable organizations to house migrants. The French NGO, droit au logement (DAL), estimates that 50,000 migrants, illegal migrants, asylum seekers, and refugees are dangerously house in Paris. NGOs cite the large withdrawal of support for migrant housing programmes over the last 30 years. constantly exposed to the pesticides’ harmful effects.” Indeed in all countries, migrants disproportionately face forced eviction, which can only exacerbate the cycle of poverty. The position of international human rights law is quite clear. The guarantee of the right to adequate housing is for everyone and must be protected without discrimination on the basis of nationality and race (see for example the International Covenant on Economic, Social and Cultural Rights).The international treaty outlawing racial discrimination requires countries to prohibit and eliminate discrimination with respect to the right to adequate housing. These laws are buttressed by the recently ratified International Convention on the Protection of the Rights of All Migrant Workers and Members of their Families. It stipulates that migrant workers must have equal access to “housing, including social housing schemes and protection against exploitation in respect of rents”. The International Labour Organization has also issued a number of recommendations on migrant workers. The Convention Relating to the Status of Refugees gives refugees protection in equal access to housing. There is an urgent need to ensure that the State takes an active role in helping newcomers secure affordable and safe housing. It is notable that courts in both Switzerland and South Africa, for example, have applied constitutional rights in striking down laws that denied social security payments to illegal migrants and permanent residents. States also need to ensure that their laws guard against discrimination, forced evictions and that private landlords charge affordable rents and provide habitable housing. Said former South African President Nelson Mandela: “A nation should not be judged by how it treats its highest citizens, but its lowest ones.” In many instances, that means ensuring a safe and secure home for the migrant. Yet as this issue went to press, another building housing migrants in France was destroyed by fire. Migrant’s remittances – a new form of development finance for the world’s poorest countries? It is estimated that approximately 125 million migrant workers send money to support 500 million family members in their home countries, reports the International Organization for Migration (IOM). The total of officially recorded remittances exceeded US $232 billion in 2005, of which developing countries received US $167 billion – more than twice the level of development aid from all sources. into programmes that benefit society as a whole. “Workers’ remittances provide muchneeded assistance to impoverished households in LDCs, but it is necessary to develop coherent policies so that the benefits of these funds may be felt across societies,” says Anwarul. K Chowdhury, UN Under-Secretary-General and High Representative for LDCs. The publication, which includes papers prepared by participants of the 2006 Ministerial Conference of LDCs in Benin, also calls for a lowering of remitting costs through innovative microfinance institutions such as Haiti’s FONKOZE, which through a partnership with a US based bank, offers more affordable or flat fee for transfers. Recommendations in the report to the High Level Dialogue on International Migration and Development in New York on 14-15 September 2006, also included the need for governments to improve data collection on remittance flows. Take two cities with larger than usual immigrant populations at opposite ends of Europe and ask them how they manage on jobs, welfare, services, integration and human and civil rights. Here Mr. Ilmar Reepalu, Mayor of the City of Malmö in Sweden, and Ms. Francesca Maletti, Councillor for Social Policies, Housing and Immigration, in Modena, Italy give Sugumi Tanaka of UN-HABITAT’s Urban Development Branch some remarkable insights into the quest for sustainable migration policies. Both cite shortcomings on national policies not tailored to local needs, and immigrants rights. Maletti: Legal immigrants have the same local welfare rights as citizens with good recourse to financial aid, housing, and child support. The Municipality has an advice centre for immigrants, especially new arrivals. As far as the large number of illegal immigrants is concerned, under the Bossi-Fini law they only get emergency health, winter shelter, and schooling for children. Maletti: Resident foreigners now constitute more than 10 percent of the population. This requires effective integration and interactions between different cultures because they come from 121 countries. Racism or resentment among local people can build up because they perceive themselves as long-term tax payers whose funds go towards helping immigrants. The Municipality has sought to counter this through debates and cultural exchanges. Once such initiative, the “Home of Cultures” is run by Italian and foreign civil society organizations. Reepalu: We think that integration is an individual process But its the responsibility of the public authorities to help individuals meet their aspirations without violating their cultural and ethnic identity. For example, children have the right to tuition in their home language. More than one-third of Malmö’s inhabitants were born abroad or have two parents born abroad. They represent 166 nationalities. Integrating this large and diverse migrant population into a sustainable community is a huge challenge. Sometimes, political equality can be undermined by socio-economic inequality. The question is what integration means for [Swedish] society so that it can see its own deficiencies which are often manifested as discrimination. The Bossi-Fini law of July 2002 was passed by the previous center-right government led by Silvio Berlusconi and named after Umberto Bossi, leader of the anti-immigration Northern League and then reform minister, and Gianfranco Fini, head of the right-wing National Alliance, who was then deputy premier and later also foreign minister. a key element in the so-called Bossi-Fini law, requiring a foreign employee to be abroad when work and residency permits are issued, was impractical and virtually impossible to enforce. Maletti: The fact that we have immigrants with different degrees of status, and thus different access to services, makes for a schizophrenic society with different levels of citizenship, integration and social cohesion. It further fosters racist behaviour and a fight among the poor because of the different levels of poverty and exclusion. Reepalu: The social and economic consequences of cities with inhabitants holding varying degrees of ‘rights to the city’ can be severe. A black labour market and black economy endanger social cohesion. I believe that it is important to create opportunities for people to exercise local citizenship, answering legislative and other restrictions by developing new forms for governance – such as local education authorities, residential participation, and different kinds of self-management where the membership is not ruled by formal rights. To ensure a sustainable direction for immigration policies, the local level must be given greater influence over policy design, and the resources allocated to meet local conditions, so that the government grants cover the actual costs of the municipalities. Otherwise the tension between the local and the national level will probably increase, as well as the tension between immigrants and locals within the bounds of the city. Frankfurt Postcard Promoting inclusiveness and integration The German city of Frankfurt has been affected by immigration throughout its 1,200-year history. Today, about 166,000 of the city’s 655,000 inhabitants come from some 170 countries. Here, Ursula Hoyer of Frankfurt City Hall explains how the city strives to make people feel they belong whatever their linguistic or cultural background. he figures given above to do not take into account the far higher number of people with immigrant backgrounds who live here. They would make up roughly 40 percent of the city’s population. Openness to other cultures, and tolerance, combined with the idea of a shared existence based on civil society, prompted the City of Frankfurt to create and establish a realistic political concept for integration. Its objectives are to ensure that at the local level, all new citizens can participate in social life with equal opportunities as early as possible. Frankfurt wants its citizens to be able to live together peacefully. It does this by ensuring that all civil servants are properly trained, and that the institutions for which they work are kept up to date on implementing these goals. Integration is a community task that is a matter of concern to all citizens of Frankfurt. Frankfurt is a multicultural society and our main political objective is to hold it together under a common roof. It is with this in mind that since 1989, the City of Frankfurt has followed an explicit strategy for local integration. Earlier than many other cities in the Federal Republic of Germany, Frankfurt has played a pioneering role in urban administration by creating a post for an elected political representative in charge of integration policy. This official heads the city council Department of Integration, and also the Department for Multicultural Affairs. Frankfurt is today quite advanced in the application of its integration policy. Nevertheless the city shares the same challenges as all other European cities facing the expansion of the European Union and increasing numbers of undocumented immigrants. In Frankfurt they are estimated at some 30,000 people. The City of Frankfurt considers integration to be an organised set of activities on the part of local public and private entities. The integration policy for a metropolis with Germany’s highest percentage of immigrants is flexible and pragmatic. Frankfurt thus provides a number of innovative services for newcomers and residents of immigrant background. These include German-language programmes for immigrant women that are run in conjunction with school and kindergarten schedules. It also runs training programmes tailored to the needs of young people and their parents to enhance labour market opportunities. The city also runs various mediation programmes to foster mutual understanding and prevent tensions or conflict between different groups. As part of a unique programme in Frankfurt, police officers join with representatives of immigrant organizations to work for mutual understanding and tolerance. In September 2003, the Frankfurt city parliament passed an anti-discrimination guideline. So if clients are facing discrimination due to their national origin or religious affiliation, or if they are having problems with city authorities, special staff of the Department for Multicultural Affairs can help mediate. To accomplish these goals the city offers assistance to ethnic groups and cultural associations. Its role is to increase awareness of cultural change and to show that integration does not necessarily mean assimilation of minority groups within the dominant culture. Turkish immigrants are by far the largest migrant group in Frankfurt. Numbering 32,338 people, they constitute 19.2 percent of the city’s population. Next come 15,146 Italians (9%), 13,334 Serbs (7.9%), 12, 539 Croatians (7.5%), 13.105 Africans (7.8 %), and 21,201 Asians (12.6%). A total of 44,628 persons (26.5%) of the Frankfurt population are immigrants from European Union member States, and a further 80,815 (48%) come from European countries. Water a shared responsibility The United Nations World Water Development Report 2 ISBN: 92-3-104006-5 Language: English Publisher: The United Nations Educational, Scientific and Cultural Organization (UNESCO) and Berghahn Books In the three years since the launch of the first World Water Development Report at the Third World Water Forum in Kyoto (March 2003), the world has witnessed considerable change. There have been many instances of major water-related disasters: the 2004 Indian Ocean tsunami; the 2004 and 2005 hurricanes in the Caribbean, the west Pacific and the United States; the 2005 floods in central and eastern Europe as well as in many other regions; and the extensive droughts in Niger, Mali, Spain and Portugal. These are a constant reminder of both the destructive power of water and the misery deriving from lack of it in so many regions of the world. This second Report, Water, A Shared Responsibility, sets water issues against this evolving background and places greater emphasis on governance issues. more than 3 million people homeless. Overnight, considerable property was destroyed and entire communities were displaced in natural disasters that may take a decade to repair. UN-HABITAT responded quickly to the humanitarian call and as a result is now actively involved with the affected communities in Indonesia, Maldives, Pakistan, Sri Lanka and Thailand, helping rebuild homes and livelihoods with the active participation of those most in need. Nairobi Urban Sector Profile ISBN: 92-1-131803-3 Language: English HS Number: HS/802/05E Price: $5 Publishers: UN-HABITAT/ European Commission A report assessing the priority needs of the Kenyan capital city, Nairobi, proposing interventions in governance, slums, HIV/AIDS and gender, as well as in environmental issues. Planet of Slums ISBN: 1844670228 Language: English Price: $24.00 Publisher: Verso Though we scarcely noticed, our descendants will look back on 2005 as the year the planet crossed into a new epoch: for the first time in history, more of the earth’s inhabitants lived in cities than outside them. From this point onward, all future growth in the earth’s population— which is expected to reach 10 billion by 2050—will take place in cities. Of this growth, the overwhelming majority will occur in the slums of cities in the developing world. In Planet of Slums, Mike Davis begins in these dark places, offering the reader a sharply drawn sketch of the growing urban anti-world, but what distinguishes his essay is his determined attempt to explain how these places came to be. What the reader ultimately takes away from his account is a persistent tone of apocalypse, and a grim preview of what an ever-swelling, billion-strong slum population portends for the political future of the planet. United Nations General Assembly elects Mrs. Tibaijuka for another term The UN General Assembly, at the recommendation of UN Secretary General Kofi Annan, on 28 June unanimously elected Mrs. Anna Tibaijuka to serve another four-year term as UnderSecretary- General and Executive Director of UN-HABITAT. Her new term runs from 1 September 2006 to 31st August 2010. After the vote, representatives of China, Kenya, Tanzania, Nigeria and other Group of 77 countries made strong congratulatory and supportive statements. They cited Mrs. Tibaijuka’s dedication and commitment, strong and visionary leadership, and hard work in raising the profile of UN-HABITAT. They lauded the agency’s work in water, sanitation and slum upgrading, and her instrumental role in helping establish the African Ministerial Conference on Housing and Urban Development (AMCHUD). Also noted was ability and success in forging strategic partnerships with financial institutions for follow-up investment in housing and urban infrastructure. Third Session of the World Urban Forum in Vancouver billed a resounding success The Third Session of the World Urban Forum in Vancouver 19-23 June marking UN-HABITAT’s 30th birthday was praised by delegates as one of the most successful recent international gatherings of its kind. Drawing some 10,000 participants from over 150 countries, the meeting symbolized inclusiveness, with balanced participation from public, private and civil society sectors. Compared to previous sessions of the Forum, there was a notable increase in private sector participation. Youth concerns were significantly advanced by this conference with over 400 young people representing a significant number of youth-led programmes and projects. Just as the Habitat I Conference in Vancouver in 1976 placed local community problems on the international agenda, the 2006 Forum lived up to its promised theme of turning ideas to action. 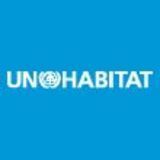 UN-HABITAT will take the WUF III outcomes to its Governing Council and, through it, to the UN General Assembly, with a call for a strengthened role of the United Nations system and international agencies in meeting the urban sustainability challenge. Construction of social housing starts in Kragujevac The ground breaking ceremony of the first site for the construction of social housing units in Serbia was held in Kragujevac 1 March, in the presence of Mr. Daniel Biau, Director of UN-HABITAT’s Regional and Technical Cooperation Division, and other dignitaries. The Settlement and Integration of Refugees Programme in Serbia (SIRP), was initiated through a memorandum between Mrs. Tibaijuka and the Government of Italy in September 2002. The Government of Italy is financing this Programme with a 15 million euro contribution. UNHABITAT, in collaboration with the Ministry of Capital Investments, is implementing the programme with the Municipalities of Cacak, Kragujevac, Kraljevo, Nis, Pancevo, Stara Pazova and Valjevo. The first public rental apartments will be handed over to beneficiaries by the end of 2006.
residents of Kibera slum in Nairobi, Kenya. The technology, inlcuding 15 computers already delivered to the UN-HABITAT supported One Stop Youth Centre in Nairobi, is being introduced following an agreement signed by Mrs.Tibaijuka and Tony Roberts Computer Aid International Chief Executive at the Third Session of the World Urban Forum in Canada. Kibera is Africa’s largest urban slum and is home to about one million people. The Computers for Communities project is part of the UN-Habitat ‘ICT for Development’ programme. 80,000 Iraqi children attend UNHABITAT rehabilitated schools With US$6.1 million from the Government of Japan, and $5.27 million from the United Nations Development Group Trust Fund, UN-HABITAT has successfully completed two out of three projects to rehabilitate and expand school infrastructure in Iraq, focusing on the capital Baghdad and the lower south of the country. The two projects have delivered comprehensive rehabilitation of 165 schools; sanitation facilities at 60 schools; furniture for 55 schools and the construction of over 300 new classrooms. The projects are now providing an improved learning and teaching environment for over 80,000 students and teachers in the cities of Basra, Samawa and Nassiriya in the lower south region of Iraq. Scroll of Honour Awards The Habitat Scroll of Honour awards will be presented during the global observances of World Habitat Day on 2 October 2006. They are currently the most prestigious human settlements award in the world. Its aim is to acknowledge initiatives which have made outstanding contributions in various fields such as shelter provision, highlighting the plight of the homeless, leadership in post conflict reconstruction, and developing and improving the human settlements and the quality of urban life. A special word of thanks to our board member, Farouk Tebbal A tireless and long serving member of this magazine’s Editorial Board, Mr. Farouk Tebbal, is stepping down as Chief of UN-HABITAT’s Shelter Branch to take up a challenging new appointment with the World Bank’s Cities Alliance in Washington DC. In a farewell interview, Mr. Tebbal was all praise for the publication saying it was “an umbilical chord, a window for us to see our partners and for our partners to see us”. Mr. Tebbal is a guru of sorts when it comes to shelter issues. Before joining UN-HABITAT in January of 2001, he had risen through the ranks in the civil service in his native Algeria to become the Permanent Secretary, Ministry of Housing. Some of his achievements at home have included tackling issues related to mitigating natural hazards in human settlements, as well as developing laws and regulations in line with pro-poor policies especially on land use and urban planning. At UN-HABITAT, Tebbal cites his coordination of the campaign on secure tenure as the highlight of his Photo © UN-HABITAT work, a campaign he helped launch in some 12 countries across the globe. He says his time on the Habitat Debate editorial board was very fulfilling especially when he helped coordinate the June 2005 issue Fighting Urban Inequities which highlighted the concept of the right to the city. Although satisfied with the quality of the publication which he says has improved over the years, Mr. Tebbal is of the view that there is room for improvement. He says the magazine should have an active readers’ forum. “This should be able to give readers a chance to comment on the topic covered in the previous edition,” and make it a “a real platform” for debate. Mr. Tebbal is optimistic that he will continue contributing to the publication. The Executive Director and members of the Editorial Board of Habitat Debate extend their heartfelt thanks to Farouk. – T. Osanjo. With its worldwide circulation online and in print, in five languages – English, Spanish, Russian, Chinese, and Arabic – Habitat Debate has a readership of about 35,000. Distributed to some 20,000 institutions, it is an ideal advertising medium for all spheres of interest to people and corporations working with cities, in cities and for cities around the world. global urban policy makers, Habitat Debate also reaches leading universities and research institutions. 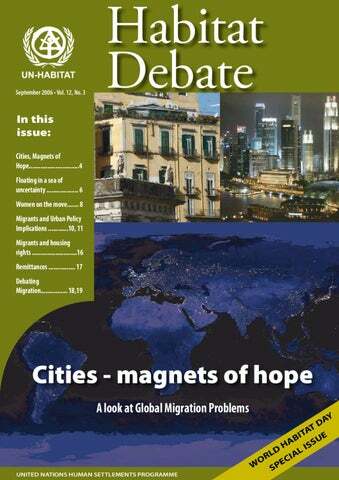 Four times a year, Habitat Debate, UN-HABITAT’s flagship magazine, carries a series of authoritative articles by the world’s leading experts on global urban developments, looking objectively at both the good and the bad of our rapidly urbanising world. $8,500 per issue if carried in more than one issue. $7,500 per issue if carried in more than one issue. $7,000 per issue if carried in more than one issue. $6,000 per issue if carried in more than one issue. $3,000 per issue if carried in more than one issue. Advertising in Habitat Debate is available four times a year. The rates quoted here are for full colour advertisements. Those that are not full colour get a 10% discounted from the rates quoted above. Each advertisement will appear automatically in all five language editions of the magazine in the language in which it is submitted – unless separate language versions are supplied. Note: The Editorial Board of Habitat Debate reserves the right to accept or refuse advertising in conformity with the standard United Nations procedures and guidelines governing advertising. Correspondence Editorial Assistant, Habitat Debate, P.O. Box 30030, Nairobi 00100, Kenya. E-mail: habitat.debate@unhabitat.org Website: www.unhabitat.org Telephone: (25420) 762 3120, Fax: 762 42 64.